A berry tone gemstone necklace to compliment your Autumn/ Winter 2017 wardrobe. The unusual vibrant-green vessonite pebbles cannot fail to impress. 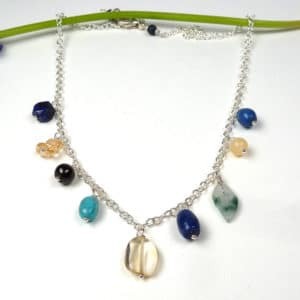 A unique gemstone necklace featuring unusual stones that is perfect for every day wear. An unusual necklace in soft berry tones. Perfect for gemstone lovers! An unusual combination of berry-tone gemstones feature in this unique necklace. Polished pebbles of luscious-green vessonite; the burnt orange hue of hessonite garnet and deep-plum rhodolite garnet. 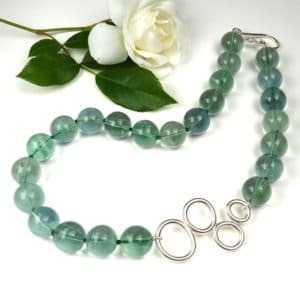 If you love unusual gemstones, then this is the necklace for you! 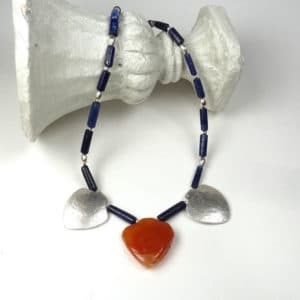 This necklace is finished with a sterling silver carabiner catch and measures 18 inches, including the clasp, when laid out flat. Dimensions of largest bead: 11 x 14mm.